The Ronin Institute is organizing its first “unconference” on Saturday, November 5, in Cambridge, Massachusetts. 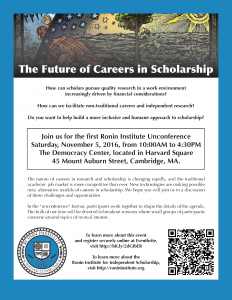 The theme will be “The Future of Careers in Scholarship“, and the event will be held from 10:00 am to 4:00 pm at The Democracy center, located in Harvard Square, at 45 Mount Auburn Street, Cambridge, MA. I hope you’ll join us! Following the success of our first round of conference support funding, the board authorized that allocation of additional funding to support travel to academic conferences, as well as research-related travel. So, in addition to our first round of awardees, we offer our congratulations to Michael Clarage, Michelle Coughlin, Ruth Duerr, Vicenta Salvador, and Eleanor Wynn. Michelle Coughlin’s award helped to support her trip to the UK to do research for the her next book, The First First Ladies, about the wives of America’s colonial governors. 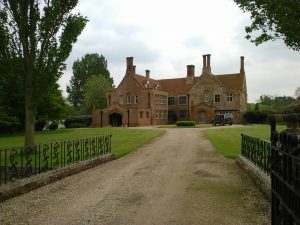 She sent along a number of gorgeous photos of the homes related to Penelope Pelham Winslow, who was married to Plymouth Colony Governor Josiah Winslow. It is great to be able to see the impact of the conference scholarship program. Our next round of funding is scheduled for January 2017. In the meantime, we are raising funds to continue — and expand — this program. The members of the board have pledged to contribute an additional matching $1000 if we are able to raise $3000 for this program by the end of 2016. So, please consider helping us by making a contribution. You can donate online: select “Conference Scholarships” to direct your donation specifically to this program. To find out more, check out our donation page. In December, the Ronin Institute published the first issue of Kitsune, a newsletter that will come out six times a year and will keep you up to date on the happenings at the Institute and in the world of alternative scholarship more generally. That first issue is now available on the website here. If you would like to receive it in your very own inbox, send an e-mail to us at kitsune@ronininstitute.org, and we’ll add you to the list. You might also add kitsune@ronininstitute.org to your address book, so that your newsletter does not wind up in your spam folder. We’ve got a lot of exciting people on the rolls now, and some cool programs in the works. Keep an eye on Kitsune, and you can stay up to date on both. It’s a problem we’ve all been faced with. You’ve got a question, the sort of question only an Anthropologist can answer. But the problem is, all of the Anthropologists you know are just so . . . uncool! This is a new feature from Cool Anthropologist and Ronin Institute Research Scholar Kristina Baines. Want to know what that thing on your leg is? Yeah . . . you really should probably go see a doctor about that.